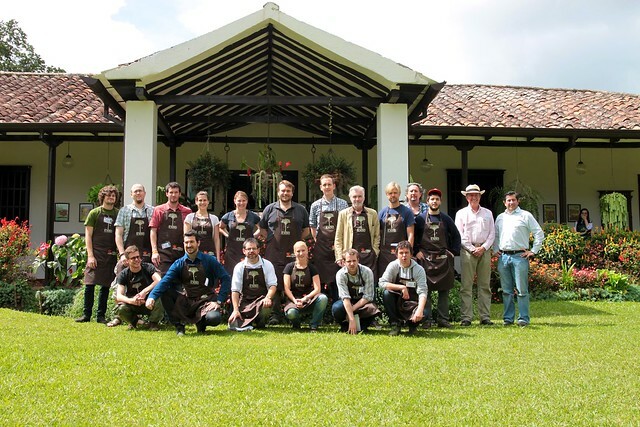 Prior to the World Barista Championship I had the opportunity to attend the Cupping Extravaganza held by Virmax and Hacienda El Roble. The extravagant part was that we were going to cup 31 varietals from one single farm. Actually we were about to cup both species and varieties. If you want to know more about this I can highly recommend this article. 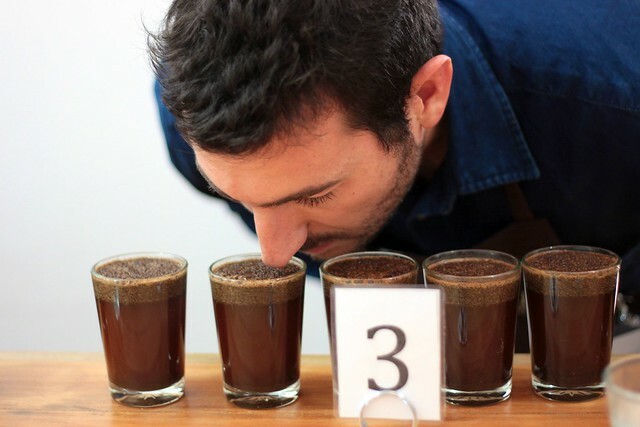 Varieties are all the rage in the coffee world right now, as you probably also noticed in the WBC presentations. However, it's quite rare that we can confidently say we're tasting the varity. Different varieties take to different climates, soil conditions, altitude and so on, so linking a single variety from one farm doesn't mean you're necessarily going to like it from another. From the cupping I've done of different varieties in different countries I have become more and more convinced that general, broad characterizations of varieties' flavours are probably not possible at the moment. The terroir and processing plays too big a role. Even tasting several varieties from one farm can be misleading, because quite often the farm expands over a large area and the varieties might be exposed to different microclimates and terroir. All this had me so much more intrigued by the idea of cupping these 31 varieties from one far, grown at the exact same area of the farm and processed the same way. And with all the controversy surrounding the new high-yielding Castillo I think it's even more important to support experimentation with varieties based on taste. 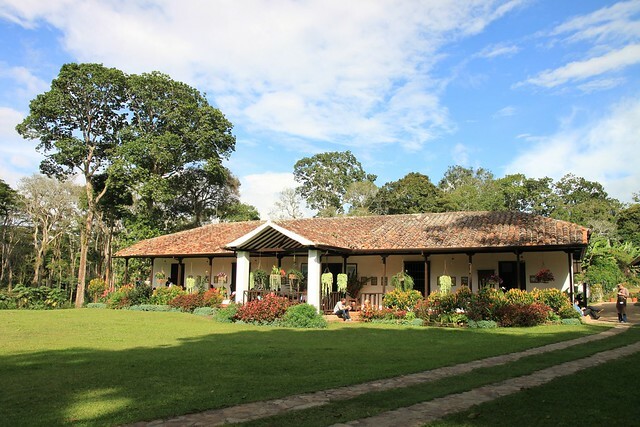 Just think how successful Hacienda La Esmeralda have been due to great tasting varieties. I must admit I had little expectations to the event, as I didn't know who was going to attend and how serious it would be. It surpassed any expectations I could have had, though. Firstly, the group that attended was awesome. Mie from 49th Parallel, Jenny Howells from Terroir, Mark Dundon from Seven Seeds, Russell Beard from The Source, Tal and Zachery from Four Barrel, Bjørnar from Kaffa, Ryan Brown from Stumptown and many many more really great coffee people attended (we were up to 20, so sorry for not naming everyone here!). It was such a nice mixture of people I've known for a long time and new acquaintances. And definitely some very experienced cuppers. 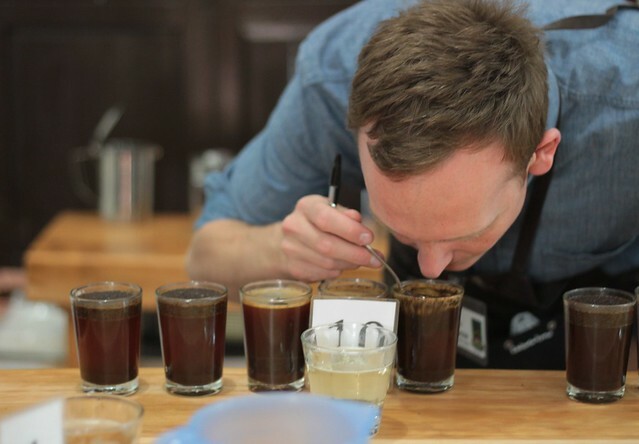 Mark and Russ came straight from the Honduras Cup of Excellence, so they were very calibrated. Next I was happy to see how professional Virmax was running the competition, following CoE procedures. It's just so nice when the organisation around a thing like this is running so smoothly that you can focus 100% on what's in the cup. A big applause to everyone at El Roble as well for being so timely and precise with coffee, water, timing etc. First day we cupped three tables (11, 10 and 10) with proper time between each table to relax pour taste buds. The next day we cupped the Top 10 from the previous day. The 31 varieties we cupped were actually out of a total of 72 varieties and species that are being grown at El Roble's coffee garden. We took a tour of the garden and I think it's safe to say everyone was impressed. It's astonishing how different the plants look. 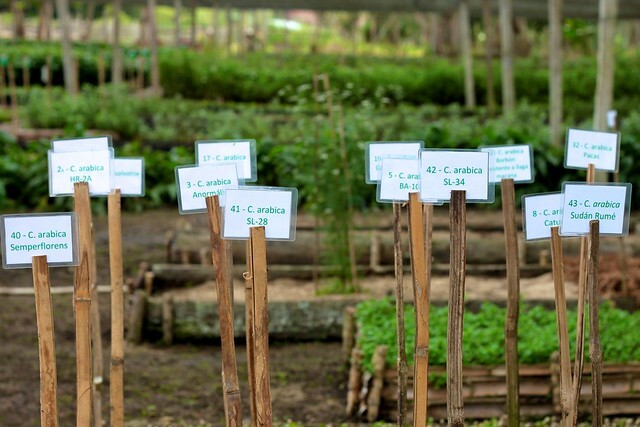 I've seen a lot of the different species and varieties in other places (for example last year at the Instituto Agronômico de Campinas) but here were even more varieties in one place. The leafs range from tiny and narrow to big round ones, that remind you of rhubarb leaves. I took a bunch of pictures, but I'm too poor a photographer to really capture that sort of thing. Besides the look of the plant you can taste a huge difference in the cherry itself and especially when sucking on the mucilage. Not all the varieties are producing enough cherry yet to process, roast and cup. I think Virmax had gone through something like 50-60 of them and after their initial cupping some could be sorted out and some there simply wasn't enough left off to roast and cup. But I also felt that 31 was quite enough for us to cup. Well, overall the difference in flavours on those tables were astonishing! There were just as much variety in flavour on those tables as a lot of roasters have in their entire assortment. And that came from one little area of one farm. We had some that tasted like earthy Indonesians, others like nutty Brazils, but more excitingly we had flavours reminding of the great Kenyans coffees and one that I would have bet was a well grown Geisha (but it wasn't). 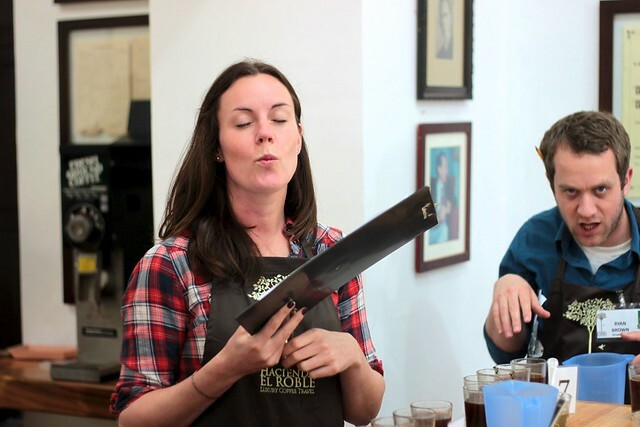 The top two coffees are mysteriously labeled "HR" for Hacienda el Roble. Until a few weeks ago the people at El Roble thought the HR61 was Coffea Liberica and the HR62 was Coffea Racemosa. Two other species of coffee, hence it was not Arabica. However, the chief scientist from the Colombian national coffee reasearch center Cenicafe was at El Roble to validate the different varieties. But he could not confirm it was those varieties, because of different characteristics (like a bronze-colored tip leaf). Unfortunately he couldn't confirm which varieties they then are. Coffee's genome has not yet been decoded, so it's not possible to confirm from the DNA. So for now those two will just be labeled "HR". The HR61 was incredibly floral with loads of jasmine, coffee blossom and also citrus fruit, orange, bergamot. A very very good coffee that really excited me. The HR62 was my second favourite. Also extremely aromatic but more fruit-tones, like peach and pear turning into berries in the aftertaste. The SL28 was a little wild and crazy and we suspected that the fermentation would need to be different for that variety. It didn't present the clarity that we're used to. Some scored it really high while some flunked it for being too fermented. Borderline coffee for sure. One of my favourites, although apparently the scorekeeper read my sheets wrong (I wrote 89 but can see how it could look like 84) was the Moka/Mocca. Super sweet and creamy with a lovely vanilla aroma in the aftertaste. It was particularly when it cooled that you noticed it. It didn't scream out as the more wildly aromatic ones, but made of for it in sweetness and mouthfeel. I'm not gonna get into detailed descriptions of all the varieties as this post is already long enough. But the Mibirizi on the last table was stunning as well. Very sweet and almost a perfumed scent of melos mixed with rosehips and lemons. Quite light mouthfeel but very delicate. Overall I'm really looking forward to more of this kind of thing. We need to encourage farmers to try different varieties. If you go through Latin America the same 8 varieties are grown almost everywhere. Now of course Esmeralda became a bit of a game changer making the Geisha famous. But the Geisha only performs well in some areas at certain altitudes. And there might be 10, 20, 50 other varieties out there that would be just as good or even better if matched with the right conditions. Farmers that I've spoken to would like to try other varieties, but their primary concern is making a living, and higher yielding plants will still give more money in the end. So if we want those better tasting varieties out there, we need to be ready to pay a lot more for them and make it financially interesting for farmers to produce them. I'd like to thank Oswaldo Acevedo, the owner of El Roble, and his entire amazing staff for hosting us and engaging in this experiment. Also thanks to Giancarlo Ghiretti and Alejandro Cadena of Virmax. And finally to the others in the 'little' group. It was great fun to get to know everyone there. Great piece, great reading Klaus! What a privilege to be a part of that event. THANK YOU FOR YOUR VISIT. AND I HOPE VERY SOON. I should have attended this trip as well. This comparison is what I am looking for, for so long. Thanks for sharing your impressions. Thanks Klaus!! Eres muy generoso en tus comentarios. Realmente para nosotros en El Roble fue un honor tenerlos como huéspedes y aún más, que hayan catado nuestras variedades. Ahora tenemos muchísimo trabajo después de su visita, queremos encontrar un buen blend para espresso y espero que quieran volver a la hacienda para probarlo. Gracias por venir y por favor: VUELVAN PRONTO!